Honda says the Civic prototype, shown, is a “really close representation” of the production model. 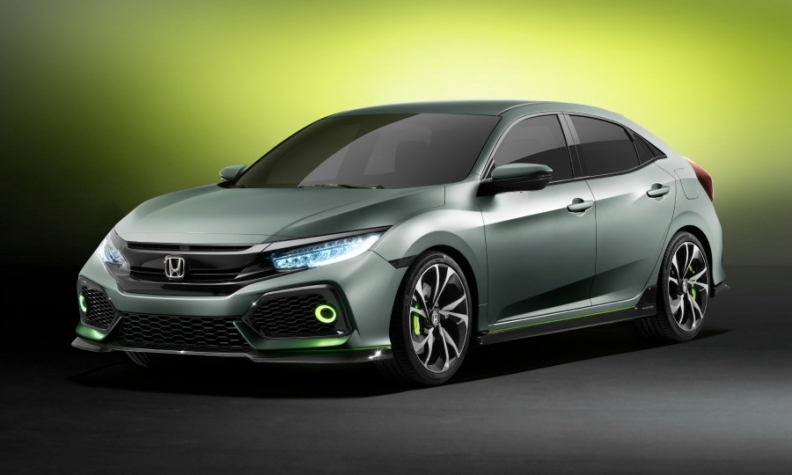 GENEVA -- Honda said the new Civic hatchback will be its sportiest version of the car to date. The automaker unveiled a near-production concept for the five-door hatchback at the auto show here today, saying its "assertive stance and provocative new design" establishes the 10th generation as the sportiest Civic ever. The Civic hatchback is a key model for the automaker in Europe and also will be sold again in the U.S. after an 11-year absence. The hatchback will become the third model in Honda's global Civic lineup following last year's launch of the sedan and the two-door coupe. The hatchback follows the design of the U.S.-launched sedan and coupe with the same gloss-finished grille bar running the width of the car up front. The prototype was shown with sporty detailing such as large frontal air intakes, side skirts and rear twin-exhaust pipes exiting from the middle. "The Civic prototype marries distinctive and sporty design, rewarding driving dynamics and versatile practicality," Daisuke Tsutamori, head of styling for prototype, said in a statement. The car is 30mm wider, 20mm lower and 130mm longer than the current-generation model, Honda said, adding that it will offer improved interior space. A Honda spokesman said the show car was a "really close representation" of what will appear in showrooms. When it goes on sale in Europe in early 2017, the Civic hatchback will be offered with a new 1.0-liter three-cylinder turbo and a four-cylinder 1.5-liter turbo. Honda described the gasoline engines as "achieving class-leading output and environmental performance," without given power or emissions figures. The model will also be sold in Europe with the automaker's current 1.6-liter diesel engine. The hatchback is built on a new global platform shared with the U.S.-launched models. That marks a change from the current model, which is produced using a European-specific platform. Honda said it has spent 270 million euros ($300 million) overhauling its factory in Swindon, southern England, to build the new car. The current Honda Civic has struggled against rivals in a fiercely competitive compact segment in Europe that is dominated by European models such as the Volkswagen Golf and Opel/Vauxhall Astra. Last year Honda sold 43,113 Civics in Europe, according to figures from JATO Dynamics. It is Honda's second biggest seller in the region after the CR-V compact SUV. The best-selling compact, the VW Golf, achieved sales of more than 500,000. "We hope the Civic will continue to be a key volume pillar for the European business," Jean-Marc Streng, head of Honda's European car division, said of the new model in the statement.